David Green holds a degree in physics from Oxford University (with honors) and an MBA from Harvard Business School (with distinction). After HBS he worked for four years as a strategy consultant advising global companies and Nelson Mandela’s new government of South Africa. After returning to the U.S. and marrying his American sweetheart, he returned to his roots in science-based businesses. He founded, and was CEO of, two biotechnology companies. The first was Harvard Bioscience, which makes scientific instruments used in biopharmaceutical research. The second was BioStage, which makes a stem-cell therapy to treat, and hopefully cure, esophageal cancer. He took both companies public and has raised over $100m in private and public capital. After suffering a near-fatal road accident in the summer of 2014 he resigned from being CEO of BioStage. While at home recovering from the accident, he did the research on getting his home to a zero-carbon footprint. 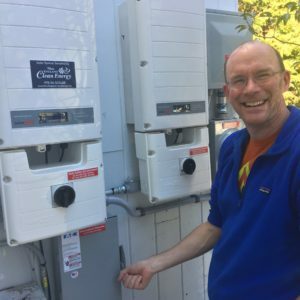 Having “gone zero” and having saved thousands of dollars a year, he now wants to help as many people as possible to do the same.